#1. This week's number one is an experienced international center Jaime Lloreda (204-80, college: LSU, currently plays in Uruguay). He could not help Hebraica (1-8) in their last game. Despite Lloreda's very good performance Hebraica lost 85-90 in a derby game to the lower-ranked (#6) Trouville. He had a double-double by scoring 27 points and getting 14 rebounds in 34 minutes on the court. There are only three games left until the end of the Regular Season. So now every game will be critical. Lloreda has individually a very good year with high stats. He averages: 20.6ppg, 9.6rpg, 1.7apg, 2FGP: 57.9%(55-95) and FT: 62.0% in seven games he played so far. 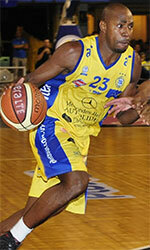 Ex-Magnates de Calidonia player is currently a member of the Panamanian senior national team. #2. Second place goes to an international guard Eugenio Luzcando (190-95, college: Idaho St., currently plays in Argentina). Luzcando was not able to help Bahia Basket (2-9) in their last game on Monday. Despite his very good performance Bahia Basket was defeated 76-69 on the road by the higher-ranked Estudiantes Concordia (#16). Luzcando was the top scorer with 19 points. He also added 3 passes. But this is still an early stage of the season and everything may happen. Luzcando's overall stats this year are: 9.6ppg, 1.9rpg, 1.3apg, 1.9spg, 2FGP: 57.6%(19-33), 3FGP: 36.8% and FT: 61.5%. He has a dual citizenship: Panamanian and Chilean. Despite Luzcando played previously for the Chilean U16 national team, he is currently a member of the Panamanian senior national team. #3. The Panamanian player who performed third best last week abroad was an international forward Michael Hicks (196-76, college: Texas A&M-CC, currently plays in Argentina). Hicks led San Martin Corrientes to a victory over the closely-ranked La Union (9-15) 86-82 in the Argentinian La Liga on Monday night. He was MVP of the game. Hicks scored 27 points (!!!) and grabbed 4 rebounds (went 6 for 6 at the free throw line) in 25 minutes. San Martin Corrientes (8-5) is placed fourth in the La Liga. But the season just started, so everything may happen. It's Hicks' first year with the team. He has very impressive stats this season: 16.2ppg, 4.1rpg, 1.2apg, 2FGP: 45.2%, 3FGP: 36.2% and FT: 79.6% in 13 games. Ex-Toros del Chiriqui David player is also a member of the Panamanian senior national team. #4. Power forward Jamaal Levy (206-83, college: Wake Forest, currently plays in Argentina) is a teammate of previously mentioned Eugenio Luzcando and both played together in the last Argentinian La Liga game. Levy was not able to secure a victory for Bahia Basket (2-9) in their last game on Monday. Despite his good performance Bahia Basket was defeated 76-69 in Concordia by the higher-ranked Estudiantes (#16). Levy scored 11 points and grabbed 5 rebounds. It's Levy's first season with the team. His overall stats this year are: 9.0ppg, 7.1rpg, 1.4apg and 1.8spg. Levy is also Panamanian national team player. #5. International forward Akil Mitchell (206-92, college: Virginia, currently plays in France) contributed to a 3-point Boulazac Basket's victory against one of league's weakest teams Levallois (3-14) 69-66 in the French Jeep ELITE on Friday night. He scored 6 points, had 4 boards, handed out 5 passes and blocked 2 shots. 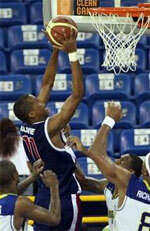 Boulazac Basket Dordogne (10-9) is placed tenth in the Jeep ELITE. It was his team's third consecutive victory in a row. Mitchell's overall stats this season are: 9.3ppg, 5.4rpg, 2.7apg and 1.4spg. He is a naturalized American. Mitchell plays currently for the Panamanian national team. Strangely he has never played in Panama. #6. Forward Tony Bishop (201-89, college: Texas St., currently plays in Romania) couldn't help Pitesti (7-9) in their game against Sibiu (13-4) in the Romanian Liga Nationala, despite his very good performance in Sunday night's game. Bishop was the second best scorer with 17 points. He also added 5 rebounds in 29 minutes. But the sixth-placed Pitesti (7-9) was badly defeated 104-86 on the opponent's court by the leading Sibiu in the Group Red. Bishop has relatively good stats this year: 13.2ppg, 6.5rpg and 1.3apg in 11 games. He is an international player who is currently on the senior Panamanian National Team roster. #7. International guard CJ Rodriguez (188-94, college: S.Nazarene, currently plays in Argentina) couldn't help Deportivo Viedma (15-9) in their game against CA Platense (16-7) in the Argentinian La Liga Argentina (second division). Despite his good performance last Wednesday Rodriguez scored 12 points and added 4 assists. This season Rodriguez has relatively solid stats: 11.2ppg, 4.0rpg and 2.2apg. He is a naturalized American. Rodriguez is also Panamanian national team player. He used to play for Caballos de Cocle Aguadulce in Panamanian league. #8. Center Javier Carter (203-91, college: S.Alabama, currently plays in Israel) couldn't help Kiryat Motzkin (11-5) in their game against Maccabi Rehovot (6-11) in the Israeli National League (second division), despite his very good performance on Tuesday night. Carter had a double-double by scoring 26 points and getting 10 rebounds in 34 minutes. But Kiryat Motzkin lost 92-105 in Rehovot to the one of league's weakest teams (#13) Maccabi. Carter has very impressive stats this year: 20.3ppg, 8.9rpg, 1.7apg and 1.1bpg in 16 games. He is a naturalized American. Carter plays currently for the Panamanian national team. He used to play for Caballos de Cocle Aguadulce in Panamanian league. #9. Former international forward Pablo Rivas (198-94, college: N.C.Central, currently plays in Spain) couldn't help Vic (5-14) in their game against HLA Alicante (15-4) in the Spanish LEB Silver (third division). Despite his good performance in Friday night's game He recorded 11 points, 6 rebounds and 2 blocks. There are only three games left until the end of the Regular Season. So now every game is very crucial. Rivas has reliable stats this season: 12.8ppg, 4.4rpg and 1.2bpg. Worth to mention Rivas played also at Eurobasket Summer League, which helped him get the job in pro basketball. He used to play for the Panamanian national team three years ago. #1. Doron Lamb (193-G-91, college: Kentucky, currently plays in Greece) could not help Lavrio (4-11) in their last game. Despite his very good performance Lavrio was edged in an overtime 94-93 at home by the one of league's weakest teams (#13) Cretan Kings. Lamb scored 16 points and grabbed 5 rebounds in 30 minutes. It was Lavrio's third consecutive loss in a row. Lamb has relatively good stats this year: 13.6ppg, 2.6rpg and 2.3apg in 15 games he played so far. He is a naturalized American. Strangely Lamb has never played in Panama. #2. Kaleb Joseph (190-G-95, currently plays college basketball in the States) managed to help Creighton University in a victory against the Butler University (6-1) 75-61 in the NCAA last Friday. Joseph scored only 3 points in 9 minutes on the court. The Creighton University has 1-4 conference record this season. This year Joseph's overall stats are: 3.8ppg and 1.2rpg in 21 games. He is a naturalized American. Apparently Joseph has never played in Panama. #3. Anell Alexis (200-F-90, college: Marist, currently plays in Germany) contributed to a BV Villingen-Schwenningen's victory against the third-ranked Fraport Skyliners II (11-7) 75-65 in the German ProB (third division) on Saturday night. He scored 7 points. It was the game of the round between two top 3 ranked teams in group South. wiha Panthers Villingen-Schwenningen (12-6) is placed second in South group. There are only four games left until the end of the Regular Season. So now every game will be critical. Alexis' overall stats this season are: 6.6ppg, 3.4rpg and 1.1apg. He is a naturalized American. Alexis used to play for Caballos de Cocle Aguadulce in Panamanian league.